21 exhibits inform visitors about the strategic and logistical challenges when the Porsche museum travels all over the world. The Porsche Museum is at home not just at the company headquarters in Zuffenhausen, but all over the world. The cars in the museum’s collection are not just displayed in Stuttgart, but are exhibited around the world as brand ambassadors. With the special exhibition “Roadbook. The Porsche Museum on the road around the world”, the museum curators are giving fans of the brand a glimpse behind the scenes for the first time: from vehicle deployment planning to appearances by celebrity drivers and preparing tours, visitors can get an impression of the strategic and logistical challenges. The special exhibition will run from today until April 23, 2017, including on the upcoming German public holiday for “All Saints’ Day” on Novem-ber 1, 2016. The 959 Paris Dakar from 1986 is being presented in a container in real size. The “rolling museum” travels all over the world 365 days a year. Each year, the museum handles over 200 vehicle deployments in more than 30 countries. Impressive images attest to the global deployment of the Stuttgart-based vehicles. 21 exhibits inform visitors about, for example, transport and logistics for the valuable freight by land, sea and air, as well as technical preparations and follow-up tasks for all sportscars with the Porsche crest on the bonnet. Another attraction is the 911 model from 1966, which was photographed “Around the World” in front of earth’s most famous landmarks in 2013 as the “eleven” celebrated its fiftieth anniversary. The special exhibition also features the 911 Carrera RSR, which took part in the Targa Florio on Sicily, the 911 SC Targa, a competitor in the “Top City Classic China Rally”, and the 356 A 1600 Speedster, which toured the coast roads on the west coast of America as part of the “California Mille”. The new special exhibition “Roadbook. The Porsche Museum on the road around the world” gives a glimpse behind the “rolling museum” of Zuffenhausen. The museum’s own workshop team provides technical support both before and during the deployment of the vehicles. As a central component of the Porsche Museum’s philosophy is to have as many of the sportscars and racing cars in a driveable condition as possible, the museum’s own workshop can carry out almost all work in house, from servicing to full restorations. The drivers are picked just as carefully as the vehicles for deployments of the “rolling museum”. Although it is primarily former and active works racing drivers who drive the vehicles on the race track, celebrities are among those who climb behind the wheel of the Porsche classics in vintage car rallies. Among the most well-known participants of the last few years are actor and racing driver Patrick Dempsey, musicians such as Udo Lindenberg, actors such as Richy Mueller as well as renowned racing drivers including Mark Webber and Derek Bell. Photographs and films in the special exhibition document both the work and the appearances by mechanics and the celebrity drivers. The Porsche museum also uses its motor racing vehicles as brand ambassadors worldwide like the Porsche 911 (996) GT1 that is part of the exhibition for the very first time at all as well as the Porsche 962 Dauer Le Mans GT. The special exhibition also gives a glimpse into the concept behind the Porsche Museum. Every week, vehicles in the exhibition are exchanged as a result of the global deployments, with new arrangements providing visitors with an ever-changing image. The Porsche Museum therefore has a vitality and diversity that is rarely encountered elsewhere. The museum’s backbone is its vehicle collection, which stretches back to the very beginning in the 1950s. Porsche has preserved particular sportscars and racing cars from all eras of the company’s history – from electric cars from the early 20th century through to motor racing vehicles from the current season. The collection also contains prototypes, studies and production ve-hicles. The historic vehicles are also regularly used internally by Porsche for things such as comparison test drives, assembly tests, trial runs or type approvals. The museum exhibits therefore also fulfil the function for which they were originally built – they drive! 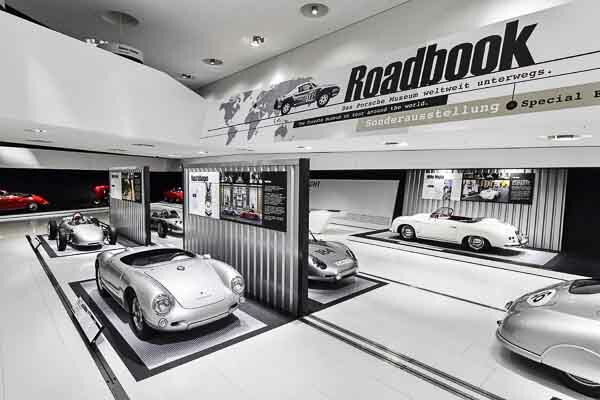 Until April 23, 2017, the Porsche museum presents its new special exhibition “Roadbook. The Porsche Museum on the road around the world”.